The giraffe (Giraffa camelopardalis) is an African even-toed ungulate mammal, the tallest living terrestrial animal and the largest ruminant. Its species name refers to its camel-like appearance and the patches of color on its fur. Its chief distinguishing characteristics are its extremely long neck and legs, its horn-like ossicones, and its distinctive coat patterns. It is classified under the family Giraffidae, along with its closest extant relative, the okapi. The nine subspecies are distinguished by their coat patterns. 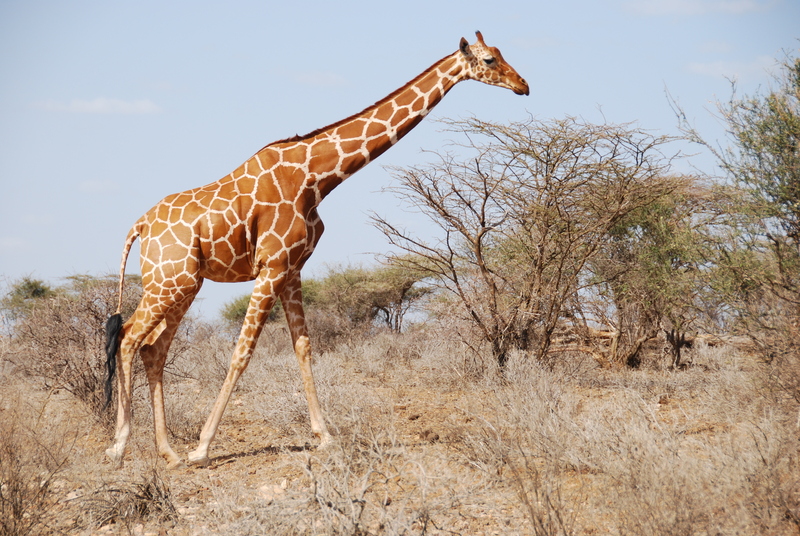 The giraffe’s scattered range extends from Chad in the north to South Africa in the south, and from Niger in the west to Somalia in the east. Giraffes usually inhabit savannas, grasslands, and open woodlands. Their primary food source is acacia leaves, which they browse at heights most other herbivores cannot reach. Giraffes are preyed on by lions; their calves are also targeted by leopards, spotted hyenas, and wild dogs. Adult giraffes do not have strong social bonds, though they do gather in loose aggregations if they happen to be moving in the same general direction. Males establish social hierarchies through “necking”, which are combat bouts where the neck is used as a weapon. Dominant males gain mating access to females, which bear the sole responsibility for raising the young.